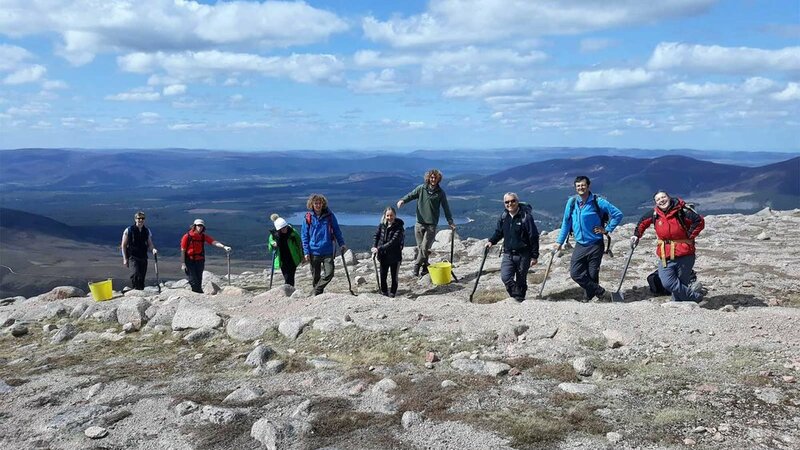 Volunteering in Scotland’s two National Parks reached an important milestone this month as the unique five-year conservation project, The Mountains & The People, reached the magical number of 1000 volunteer days. Led by the Outdoor Access Trust for Scotland, this partnership project brings together Scotland’s two National Park Authorities, Cairngorms and Loch Lomond & The Trossachs, alongside Scottish Natural Heritage, Forestry Commission Scotland and the Heritage Lottery Fund. The vision is simple: to involve the people of Scotland and beyond in the enhancement and protection of the wild and special qualities of the mountains within Scotland’s National Parks. Since project launch in the summer of 2015, volunteers have been working hard to protect mountain habitats from the impacts of erosion across both of Scotland’s National Parks. Affectionately nicknamed ‘a walk with a spade’ these conservation volunteering days are the backbone of the project and include volunteers walking section of mountain path whilst undertaking basic path maintenance, drain clearance and habitat repair as they go. In celebration of achieving this amazing number of volunteer days, a team of volunteers took to the hills to complete a ‘drainage run’. It might have been a wet day, but that made perfect conditions for checking where the problems on the path are. A slice of cake was enjoyed by all which was kindly donated by It’s All About Cake in Garelochhead, in celebration of the event.